Last year, Mike Procter returned to Bristol to speak as I believe he had also done the year before. It was too good an opportunity to miss listening and speaking to one of cricket's true greats and legends of the game and I suspect that I was not alone in feeling honoured to have attended. I came away thinking that Mike Procter was one of cricket's most humble and pleasant men. I was aware that Mike's autobiography was due out and am grateful to Pitch Publishing for sending me a copy. What immediately stands out about Mike's book, Caught in the Middle, is the same respect shown as the evening in 2016 in Bristol. Many of us have visions of cricketers, the deeds which we all remember them by and, okay, I am probably no different in remembering the famous Hampshire and Gloucestershire 1977 Benson and Hedges semi-final in 1977. It still seems fresh in my memory. There is, though, much more to Mike Procter than that one memorable match. His Test career, like other South African players at the end of the 1960s, was limited to seven matches ( and a remarkable 41 wickets). He does not bemoan his fate, though, and writes of the opportunity given to him by Kerry Packer in the revolution at the end of the 1970s which forever changed cricket. Mike has been involved in cricket in many forms: player, coach, commentator and match referee. There have been a couple of unsavoury and unfortunate episodes during his tenure as a referee which would have surely rankled with this fairest of men but his views are written fairly. Not everything has necessarily gone his way but the feeling, on reading Mike's autobiography, is that he has been satisfied to have been so heavily involved in both South African and English county cricket. Mike now works hard in coaching many under-privileged children in South Africa. Everyone is given a chance regardless of talent and, with families sometimes unable to provide a decent meal for their children, this also falls within Mike's remit. It requires money and is a thoroughly worthwhile cause to support. Having met Mike Procter at Bristol that evening in 2016, I am not now surprised at the modest way in which his autobiography has been written. This is a story of a thoroughly decent man who has given many, many hours of pleasure to cricket fans and now gives as much to deserving children in South Africa. 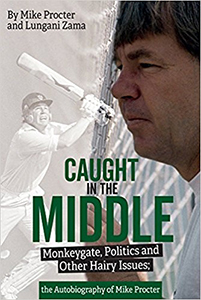 Caught in the Middle is a moving and fascinating book and I would urge readers to read it.